Kresge College is poised to go through a physical renewal in the coming years as the campus seeks to revitalize UC Santa Cruz’s sixth college. As a result, the committee has hosted a number of events and widely solicited the perspectives of Kresge’s past leaders, including former provosts and faculty, and alumni. Kresge College’s buildings are nearing the end of their expected material lifespan, and deterioration is compounded by effects of the marine environment and other factors. 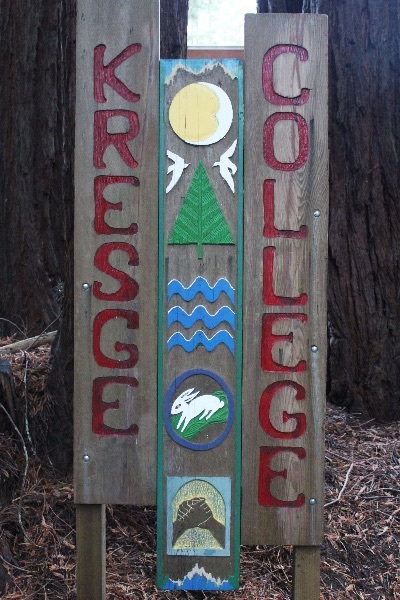 Kresge College was built in 1973, the sixth college to be constructed at UC Santa Cruz. The housing sections of the five older colleges have been renovated. The renewal of Kresge College is driven by the age of the college and expected signs of deterioration. However, it is also part of a broader campus effort to expand student housing on the west side of campus. Like with other college renovations, UC Santa Cruz is looking to increase the number of beds at Kresge—from 363 to about 500 or 600—while also soliciting feedback on ways to improve the student experience. In an effort to address student demand, expand quality housing options, and address needed renovation of current housing units such as Family Student Housing, the campus is undertaking a housing initiative that will add up to 3,000 new beds. This project is part of UC President’s Housing Initiative and will likely be built through a public-private partnership; the Kresge project is being evaluated to understand how it integrates with the larger housing initiative and other efforts to provide additional classroom and academic space on campus. The committee is co-chaired by Provost Ben Leeds Carson and Vice Chancellor for Business and Administrative Services Sarah Latham, and includes students, faculty, and staff. Concurrent community engagement workshops have been running since February when the committee’s work kicked off. In May, the committee finalized a visioning brief that distilled goals for the project and lays out desired program elements—academic, residential and student support spaces. classroom, co-op, fitness, food service, gathering, study, administration, residential, and support. Kresge College was designed by Charles Moore and William Turnbull, and built in 1973. In many respects, Kresge’s design and features were a watershed moment for postmodern architecture, implementing an impressive range of experimental approaches to living and learning environments. The college’s hilltop layout, inspired by medieval Italian hill-towns, along with its flexibility in integrating residential, social, and academic space, have been widely cited and admired in the architectural community. However, many elements of the space that captured attention and praise in the college’s early years have proven challenging for many generations of students. The Kresge Project Committee has worked diligently to conceive of a future for the space that reimagines the Kresge environment in ways that will further the college’s founding ethos of collaborative and innovative design. The campus is concluding the planning phase and will be studying a variety of approaches and options, with further opportunities for engagement once next steps are clarified.